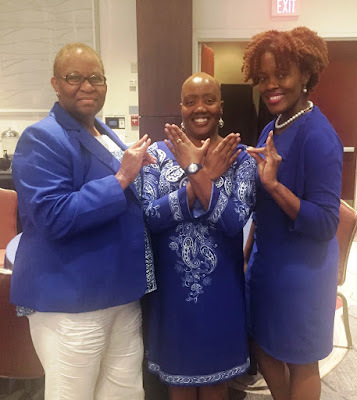 Kappa Iota Zeta Chapter was well represented at the Zeta Organizational Leadership Conference held in Washington, DC. Soror LaNise Thrasher attended pre ZOL training called the Basilei Institute, which included seminars on “Conducting Effective Meetings” and “Protocol Basics” among other informative topics. Sorors LaNise Thrasher, Contessa Paige, Susieann Beavers-Harris, Lashelle Scott and IrisEllena Calder all attended ZOL. The conference consisted of four action packed days filled with opportunities to network, develop leadership skills and learn about behavioral traits. Soror Beavers-Harris’ favorite part of ZOL was the DISC Assessment. “Using DISC allows me to understand how my behavior affects others and what I need to do to shift my behavior based on the situation,” she revealed. “It is also a great tool for assessing behaviors of others which makes it most valuable in conflict resolution and getting things done”. When asked what motivated her to attend ZOL, Soror Scott shared that her motivation “was to increase my leadership skills as well as learn more about Zeta Phi Beta”. Soror Thrasher plans to use what she learned at ZOL to improve her “interactions with sorors on various committees and while working with the Undergraduates”. Soror Paige summed it up best – “As proclaimed by International Grand Basileus Mary B. Wright, “A good Zeta is a well-informed Zeta.” Since the first moment I heard this declaration, I realized that I need to actively acquire as much knowledge as I can about my beloved sorority. For me, that means becoming proficient in all aspects on the local, state, regional, and national levels. To achieve these goals, it is essential to participate in conferences, training's, and webinars whenever possible”.